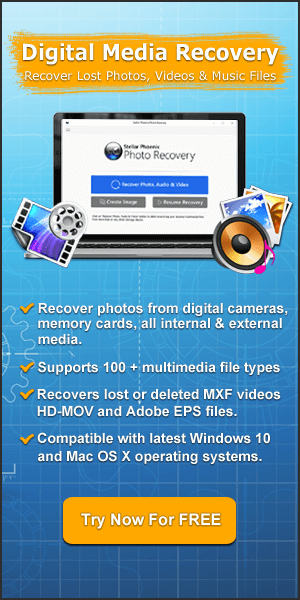 World’s Best And Widely Used Photo Repair Tool To Fix Damaged or Corrupted JPEG/JPG Files! 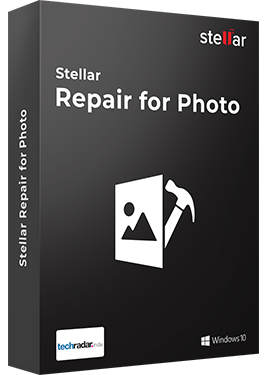 Stellar JPEG Repair for Windows or Mac is one of the best, popular and widely used software that is used all across the world. This JPEG Repair is designed to repair corrupted or damaged .JPEG or .JPG image file extension. I have found in several forums and community websites that there are lots of users out there, whose precious photos gets corrupted, damaged, blurred, split and so on. Thereafter they look for the solutions on how to repair damaged or corrupted photos. So, if your JPEG photos has got corrupted, pixilated, damaged or blurred, then JPEG Repair software will help you to fix your precious or important photos. 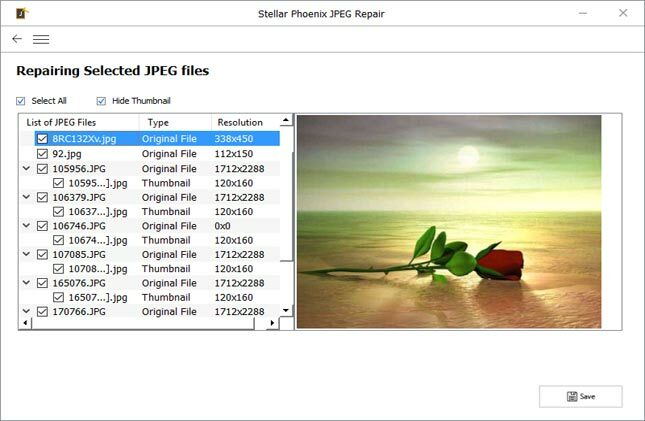 Repair and fix corrupted or damaged JPEG or JPG files. Fix corrupted JPEG photos recovered from corrupted storage devices. Repair multiple JPEG files at the same time. Repair/Fix corrupted header and Invalid JPEG file structure. Retrieve thumbnails of severely corrupted/damaged JPEG files. Repair JPEG file format photos saved in PC , Mac, laptop, external hard drive, memory cards. Shows preview of damaged or corrupted JPEG/JPG files within software. 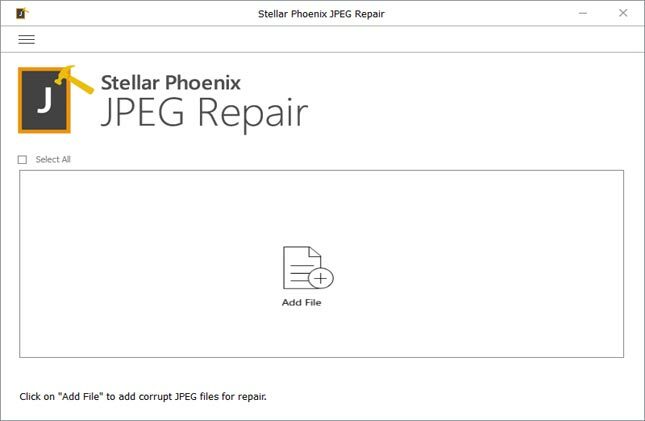 Repair corrupted or damaged JPEG/JPG photos and easily recover them from various data storage devices such as memory cards, USB flash drives, computer (PC/Mac) internal hard drive or external HDDs, SSD, memory sticks, digital cameras or any other storage media devices. 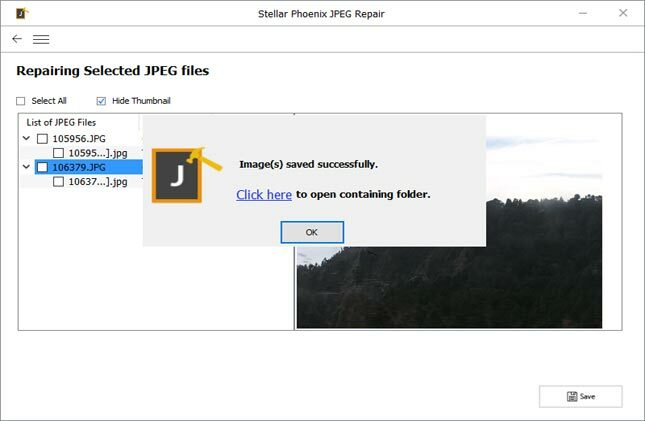 JPEG Repair completely fixes your unreadable JPEG images, even severe cases of corrupt header, invalid JPEG file structure, invalid or unknown JPEG marker, missing SOS marker, corrupt JPEG data, etc. 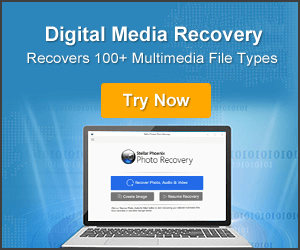 With this JPEG Recovery software, you can easily retrieve embedded thumbnail of the JPEG images that got severely corrupted without compromising its visual quality. This is one of the best features of this tool and it is very helpful for JPEG images that have got severely damaged and cannot be repaired – it means that the JPEG photos have undergone severe corruptions or damages beyond repair. But with this JPEG Repair, you can easily restore thumbnails of those images. 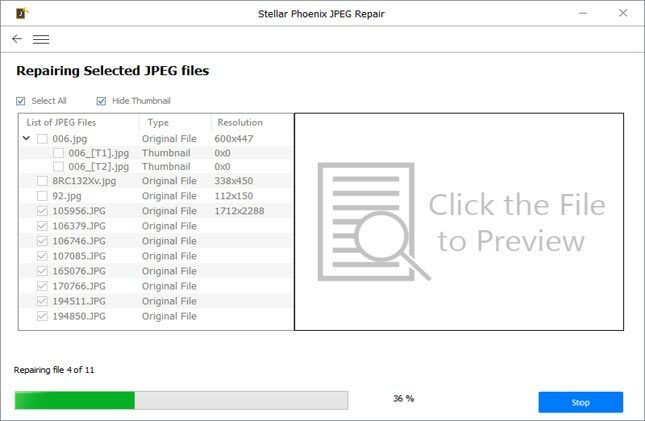 This JPEG Repair Tool for Windows and Mac support batch repair, it means that you can repair multiple JPEG/JPG files in a single operation at same, saving your important time. Once the repair process gets completed, you can then select the images that you want to save on your computer at your desired location. This JPEG Recovery software also offer preview option that allow you to preview the repaired jpeg files after the scanning process. Preview option is very handy as it allows you to see the images within the preview screen of the software to check whether your image has properly fixed or not before you save them on your computer. Once you see that image has been properly repaired and fixed, you can then recover and save them on your computer. This JPEG file repair tool comes with inbuilt optimized scanning engine that enhances its repair performance with many folds. The tool easily and quickly scans multiple JPEG photos in a batch and provides result in less time. Besides repairing jpeg files, this number 1 rated software also offer flexible saving options. The software allows you to select the destination path of your choice to save repaired JPEG photos on your computer. JPEG Repair tool saves all the thumbnails of repaired jpeg files to separate folder. The software comes with easy to use interface and hence it becomes very easy to operate, there is no requirement to know technical knowledge. The step-by-step interface helps you to easily perform JPEG recovery with less effort and time. 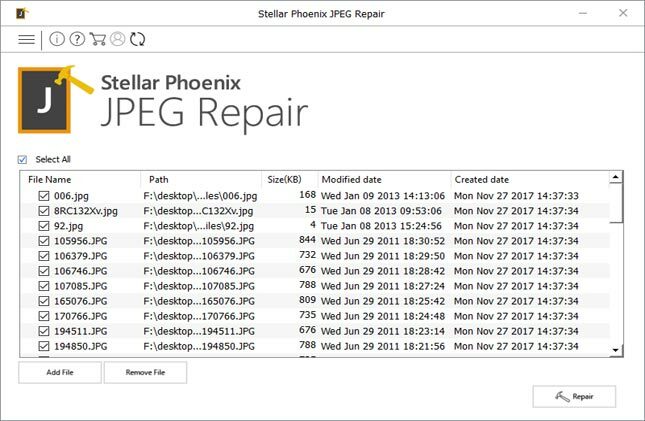 Stellar JPEG Repair Tool repair and fixes corrupted, damaged or broken JPEG/JPEG image file format and extract them with ease and in simple steps. Step 1: Download, install and launch JPEG Repair software on your computer. Click on “Add File” to repair corrupt/damaged JPG/JPEG files. Step 2: Selected file be listed. You can click on “Remove File” to remove file form the list. You can check “Select All” to select all files for repairing. Next, click on “Repair” to begin the repairing process. Step 5: Finally, click on “Save” button to recover and save repaired JPEG/JPG images on your computer.